Prime Minister Benjamin Netanyahu is meeting with President Donald Trump today at the White House ahead of a speech at AIPAC Tuesday. The Iran deal is on the schedule for discussion, in addition to the U.S. Embassy move from Tel Aviv to Jerusalem in May. President Trump is up against another deadline to either re-certify or decline the Iran nuclear agreement. Trump re-certified the agreement in January, but warned unless Congress makes changes, there won't be a next time. "This is a last chance. In the absence of such an agreement, the United States will not again waive sanctions in order to stay in the Iran nuclear deal. And if at any time I judge that such an agreement is not within reach, I will withdraw from the deal immediately," Trump said in a statement. "I have been very clear about my opinion of that deal. It gave Iran far too much in exchange for far too little. The enormous financial windfall the Iranian regime received because of the deal—access to more than $100 billion, including $1.8 billion in cash—has not been used to better the lives of the Iranian people. Instead, it has served as a slush fund for weapons, terror, and oppression, and to further line the pockets of corrupt regime leaders. The Iranian people know this, which is one reason why so many have taken to the streets to express their outrage. "Despite my strong inclination, I have not yet withdrawn the United States from the Iran nuclear deal. Instead, I have outlined two possible paths forward: either fix the deal’s disastrous flaws, or the United States will withdraw," he continued. "I am open to working with Congress on bipartisan legislation regarding Iran." Since January, Congress hasn't touched the deal and the chances for lawmakers to make required changes by April are slim. 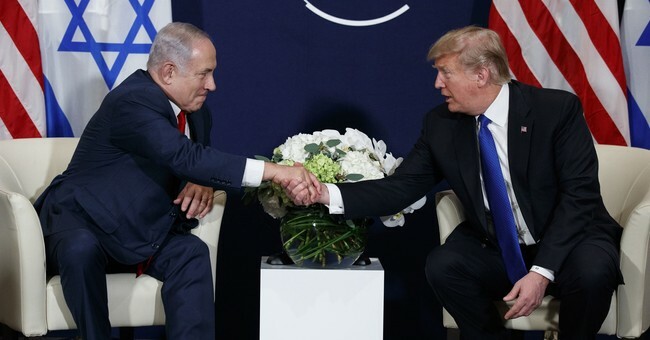 The meeting between to two leaders is the second since the Trump administration officially recognized Jerusalem as the capital of Israel.